While most handguns are fed through a single type of magazine, rifles are fed by a variety. From stripper clips to detachable boxes, rifles are fed by a variety of magazines, each designed for the selected action of the gun. 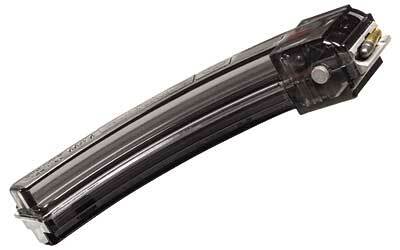 The primary magazine for bolt actions rifles is the classic stripper clip. Stripper clips are loaded through the action at the top of the gun and are fed into position by the bolt. Depending on the gun most stripper clips contain a total of five rounds and are fed into position by an internal spring in the gun mechanism. Stripper clips have their advantages; they are cheap, easy to use and lower ammunition consumption. But unlike box magazines they contain a very low amount of ammunition and once used cannot be reused. Like handguns, most semi-automatic rifles use the popular box magazine. Rifle box magazines like hand guns are inserted through a slot at the base of the receiver and like handgun magazines the bullets are loaded through the top of the magazine and fed into the gun by a spring. Depending on state gun regulations box magazines can contain anywhere from 10-30 rounds and can be reused after loading. While most rifles magazines are designed for one specific action, tubular magazines are used in both pump and lever action rifles. Tubular magazines are located beneath the barrel of the gun and like box and stripper clip magazines are fed by spring. Now, although tubular magazines are easy to load and maintain, unlike box magazines and stripper clips they will only contain as much ammunition as the tube allows and while you do not have to worry about having to buy additional clips the magazine is fixed to the barrel and cannot be removed.